Our fourth graders sat riveted, as Purple Heart recipient, LyVell Gipson read the book, The Soldier and the Squirrel, by Micaela Bensko. 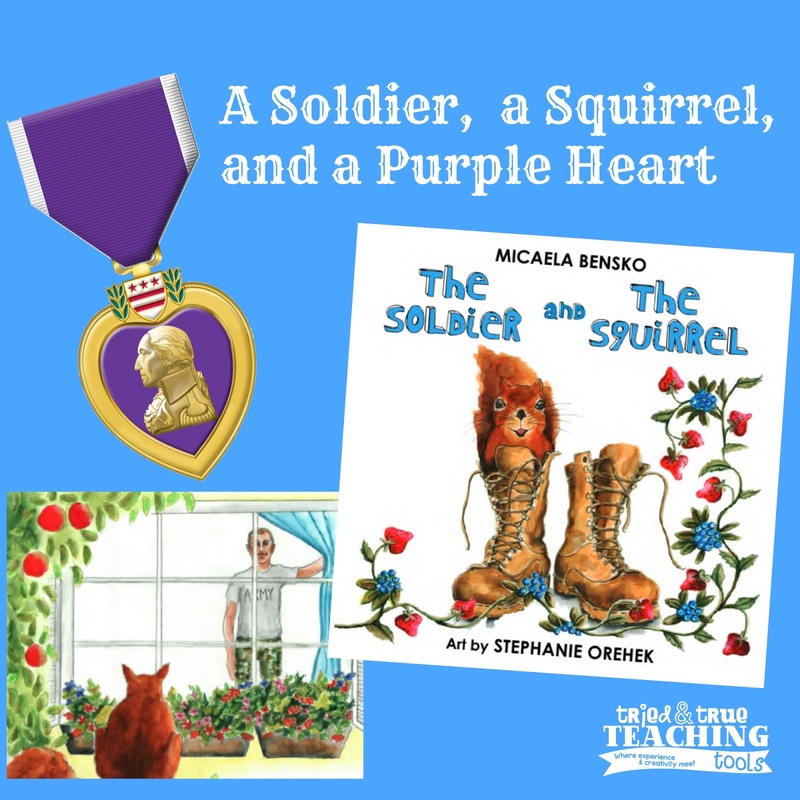 From the website: The Soldier And The Squirrel is the story of a loyal squirrel (Rocky), his hillside friends, and a wounded soldier he calls Mister. Rocky and his friends live behind the soldier's house and watch his family every day. But one day the soldier returns home with a Purple Heart. Rocky begins to question the meaning in all of this and in the end discovers the meaning of life. The Soldier and the Squirrel is not just a book - it is a tool to introduce our youth to the humanity behind the wounded warrior, as well as open the conversation about the very real effects of war, while sharing a story that reminds us all that the greatest blessings and most meaningful moments in life are often the smallest ones. Not only did our students love this sweet story that inspires and teaches the lesson of appreciation of little things, but they were so excited to meet Blue Belle "in person", the service dog in the book (as well as Micaela's service dog in real life)! 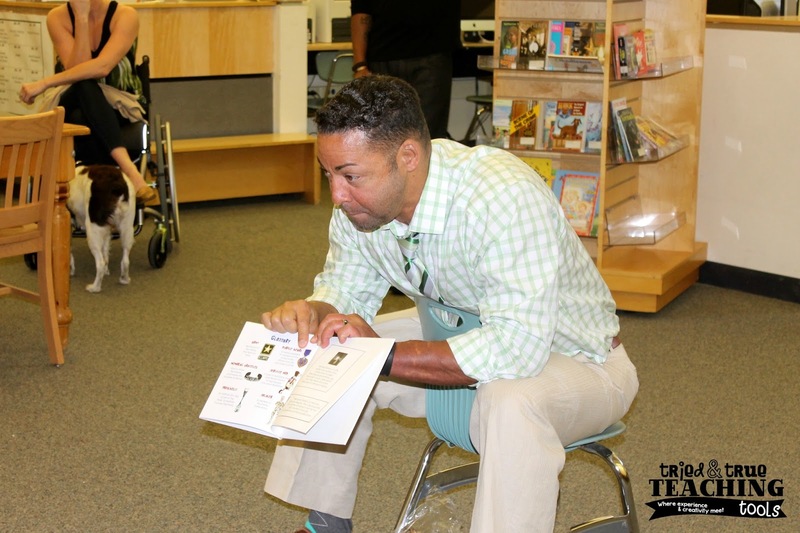 The reading led to MANY questions from our students, especially on the topic of the Purple Heart Medal. The Purple Heart is awarded to members of the armed forces of the U.S. who are wounded or killed in action or die of wounds received in action. Prior to the reading, not a single one of our students had heard of the Purple Heart and the majority only had movie or television ideas of soldiers and war. The Soldier and the Squirrel is Micaela's way of creating awareness and support for our aging and wounded veterans. LyVell openly shared his wounds with us, and talked about what it took to recover. He was an inspiring story of survival and success! Next, Marine Paul Mc Quigg shared his amazing story of perseverance and determination. He related to the soldier in the book because he, too, came home to his family after being wounded when a bomb exploded in his face, causing him to lose his tongue (and other damage). We were fascinated when he explained the doctors were able to take skin from his forearm and make a new tongue! Both men were motivating role models for loyalty, perseverance, and rising above their circumstances. LyVell and Paul came home from War, wounded and fighting for their lives. They were treated by RAW. Micaela's mother, Maggie Lockridge, is the founder of Rebuilding America's Warriors (R.A.W. ), a non-profit foundation dedicated to providing free reconstructive surgery to recently wounded and disfigured active service and veteran status warriors. Maggie is more than a philanthropist. She is a former Air Force nurse who tears up at the sight of the American flag, she has adopted over a hundred sons and daughters over the years who have changed lives with their determination to be pro-active when they discovered that someone truly cares about who they are - not just as troops at war, but warriors in life. You can see that compassion and awesomeness runs in their family!! This is a must-have book for every home, classroom, and school library! 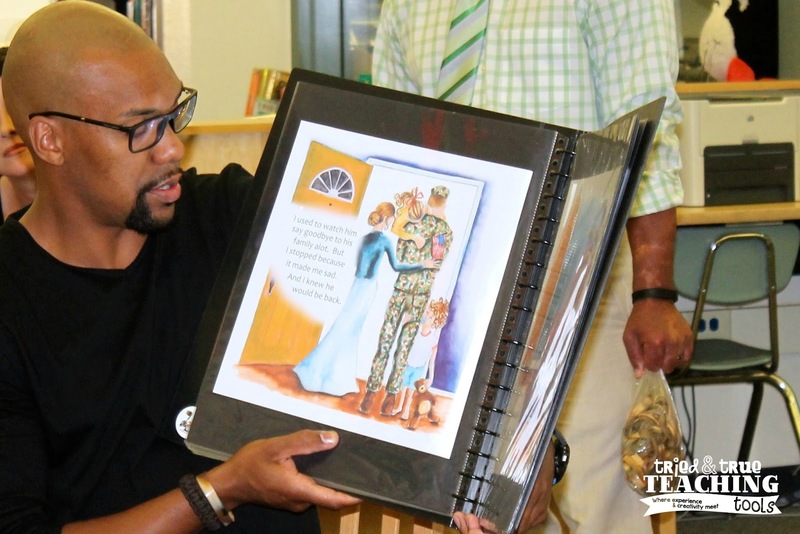 Check out The Soldier and the Squirrel website for book purchase and school visit information!